I became interested in reading the Bhagavad Gita when a small group of friends talked over the idea of reading a variety of religious texts in order to view them from each of their strengths. The first one we proposed was Bhagavad Gita, the core text of the Hindu tradition. Bhagavad Gita is written in syllabic verse—I think the translation by Stephen Mitchell does a good job in making it very user friendly. It is Book Six of India’s national epic poem, the Mahabharata, which I discovered in the introduction is eight times the length of the Iliad and the Odyssey combined. Luckily, the Gita itself is not quite so unwieldy. It begins as a battle is about to take place between two clans, the Pandavas and the Kauravas. The leader of the Pandavas, Arjuna, takes his chariot to the center of the battlefield to survey the scene, and begins to have doubts about the wisdom of going through with this battle that will kill many of his kinsmen on both sides. It is at this point that Krishna, his charioteer, who turns out to be THE Krishna, Hindu God incarnate, begins to counsel him about life. 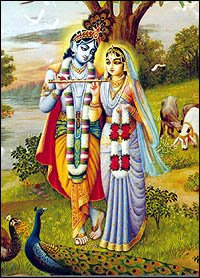 From the beginning of Krishna’s part in this story, I immediately was enveloped in the influence of this powerful text. Despite my lack of religious leanings, I still find things of value in many religious texts and the Bhagavad Gita is no exception. Emerson and Thoreau have both praised the Bhagavad Gita; in fact it was one of the books Thoreau took with him to Walden Pond. Your sorrow is sheer delusion. For the dead or for the living. A time when we cease to be. As the teachings of Krishna go on, you learn about the benefits of releasing your selfish tendencies, meditating on a higher power, and how to attain the Self that is separate from the physical self—more like the soul, that in their tradition continues to reincarnate until joined with God in perfection. With my Western, and more problematic, agnostic viewpoint, I could argue the inconsistencies of some of the views purported. For example, throughout the Gita, Krishna propones nonviolence at the same time as he encourages Arjuna to go to battle. In an Appendix to Bhagavad Gita written by Mohandas Gandhi, Gandhi writes that “under the guise of physical warfare it described the duel that perpetually went on in the hearts of mankind, and that physical warfare was brought in merely to make the description of the internal duel more alluring.” Not being a scholar of Hindu beliefs, I will graciously defer to Gandhi, for whom I have the utmost respect. In a text this old, just as in the Bible, I find there are inevitably some ideas that one should overlook in order to grasp the greater picture. I had some issues with the idea of a caste system, as well as the idea that women are a sub-incarnation to men. Overall, however, I think that the Bhagavad Gita reveals much to guide a person in self-improvement and definitely holds its place in the annals of religious texts. Aren't you supposed to be reading Don Quixote? Oh wait, only I have to struggle through that, right? It doesn't matter if the other book club members finish it. And I can definitely see the allure of NOT reading the aforementioned book. I've got about 125 pages to go, and I'm on the way to the library in just a minute to pick out something that will hopefully be kinder to my sensibilities. I've never read any religious texts except the Book of Mormon. I've read pieces of the Bible, too, but not the whole thing. In general, I'm not too fond of religious texts, so I probably won't read this one, but I'm glad you got something out of it. It's always wonderful to see things from a different point of view, and learn things about yourself along the way. Yeah, this was a nice refreshing break from Don Quixote. I figured if I waited until that one was finished, it would be another month. How far along are you in Quixote? It gets better, particularly because there's this huge section that doesn't have him in it at all. That part is actually interesting. It just took awhile to get there. I just checked out Wide Sargasso Sea on Dawn's suggestion, and a youth novel that I'm not sure I'll review here. I'm just past the part where he thinks the windmills are giants. This raises an interesting question with respect to the interpretation of scripture. Should one accept traditional and dogmatic theological interpretations or find his or her own meanings in the literature, as we would do in the modern criticism of secular writings. I suppose that depends on how important your belief is in the traditional and dogmatic theological interpretations. If someone is, for example, a very devout Christian, they may read this book less as literature than someone who is, say, an atheist. I personally believe that religious works can be read without bias and can be interpreted and searched through the same way literature is. But maybe that's because I consider myself agnostic, and do not apply to any one faith. It is interesting to try to comment on a book that has been such a major part of a world religion. Much like the Bible, the verses leave a lot of room for discussion and interpretation. To criticize any of the beliefs without a more thorough knowledge of the Hindu religion would be pretty presumptuous on my part, so I am left to find my own meaning to it, as you said. Interesting! I've never read the Bhagavad Gita, though I've wanted to, I even used to own it. From what you describe, though, I have to recommend 'The Gateless Gate'. It's about a thirty minute read if you just read it straight through, but it's one of the things I've read that still occaisionaly haunts my thinking. Not just reading about a religion, actually delving into their scripture! Congrats on keeping an open mind and investigating ideas from a different culture.